Plug and Play. No Need to Set Up. 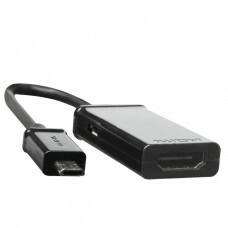 High Speed Premium MHL to HDMI Adapter for Samsung Galaxy S3/S4 and Note 2/Note 3 in Black are premium quality cables that help you extract the maximum performance from your gaming or home theater setup. * This MHL to HDMI adapter is designed for the Galaxy S3, Galaxy S4, Galaxy Note 2 and Note 3 that have 11 pin Micro USB ports. * It allows you to view videos, games, photos and other media from your Samsung smart phones directly onto an HDTV at 1080p resolution and 7.1 channel surround sound. * Built-in USB port only supplies power for the adapter. It does not charge your smartphone device.